In honor of the series finale of its much longer-running American cousin, I thought I’d share a look back at the original The Office. Seeing as this one came first I’ll resist the urge to point out which British character = which American one. A cold open, selected for the sole purpose of showing us the main character’s lack of ethics, shows an executive at his desk. With some alliterative, fast-paced business jabber, he offers to give the man across from him a job as a forklift driver without having passed a forklift-driving test. He seems quite pleased with his deception as he smooth talks someone on the other end of the phone. We never get a look at the unlicensed forklift driver, but that’s not who we’re here to meet. 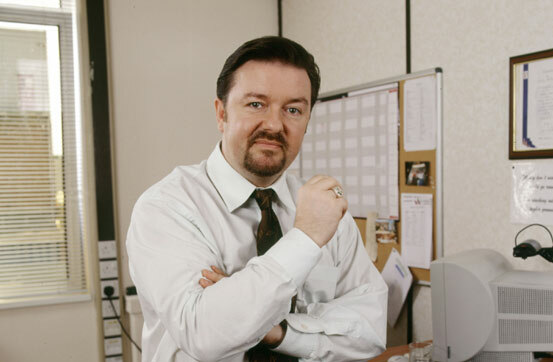 It’s all about the boss, David Brent (show co-creator Ricky Gervais). After that first scene, we launch into the mockumentary style the show helped popularize, with characters exuding dramatic irony in interview segments breaking up the regular workday activity — and by regular, I mean squabbling, practical joke-pulling nonsense. (Zero days since our last nonsense). A few key relationships are set up: Tim (a much younger-looking Martin Freeman) and Gareth (Mackenzie Crook. Hey, did you know he was the dude with the glass eye in Pirates of the Caribbean? I didn’t.) They hate each other. Lighthearted Tim torments the way-too-serious Gareth. Then there’s Tim and Dawn (Lucy Davis). It’s suggested that he likes her, but could just be that he really hates her boyfriend. I said I wouldn’t compare but this Jim and Pam aren’t as syrupy. Then there’s boss-from-corporate Jennifer (Stirling Gallacher), who’s so far at the end of her rope with David you figure they’re bound to sleep together. The crisis du jour is that corporate is planning to combine two branches of the paper company and “eliminate redundancies.” The gravity of the situation provides fertile ground for illustrating David’s complete lack of a clue, let alone ethics. As the audience, we’re left with the possibility of characters we’ve already met exiting, or new ones starting. The show introduces a tone that is so banal, and dialogue so tossed off, it’s dead easy to miss things. Throw in the British accents and slang, and Americans are at a further disadvantage. The monochromatic surroundings and bland, unattractive characters make it easy to lose interest entirely until David says something so off the wall as to demand attention. One can see how even an Americanized version would be an acquired taste, and for many, not acquirable with only the pilot. As a bonus, here’s a video on how to suspend a stapler in jelly (or as we Yanks would call it by its brand name, Jell-o). This entry was posted in 2000s, Comedies and tagged British, comedy, Lucy Davis, Mackenzie Crook, Martin Freeman, mockumentary, Ricky Gervais, the office, U.K. by meekthegeek. Bookmark the permalink. I found it so dead-pan twisted and no-eye-contact-in-an-elevator awkward as to fall in love with it on first watch. The Americanized version was too banal for me by comparison.